Did you know the Manx people have always been great travellers? One such place they travelled to was the Transvaal. 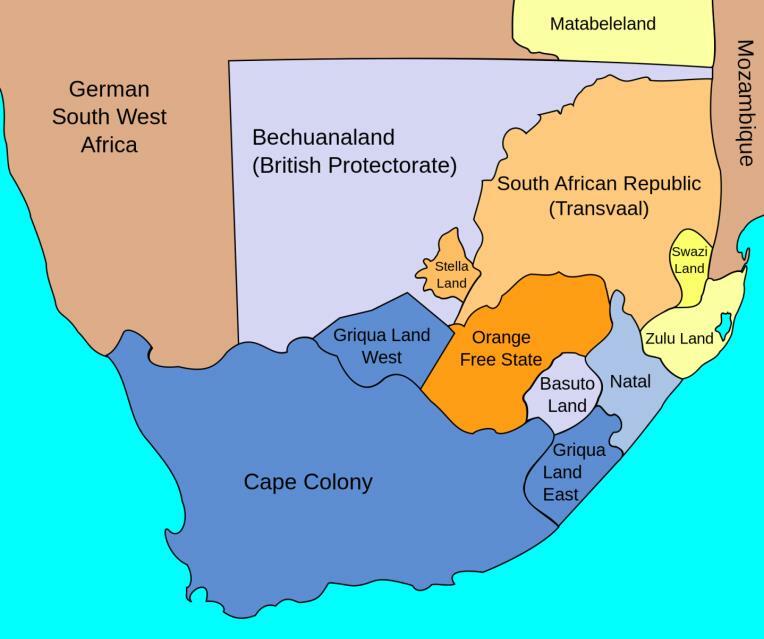 The South African Republic often referred to as the Transvaal, was an independent country in Southern Africa from 1852 until 1902, lying north east within South Africa and just north of the Vaal River. The Transvaal which in Afrikaans means ‘across the Vaal’ was occupied by Afrikaners (descendants of the Dutch settlers) in the 1830s when they migrated to the region after crossing the Vaal River. During the nineteenth century the Transvaal experienced frontier wars, the ‘Mineral Revolution’ and conflicts such as the Boer War. The area had predominately been an agricultural society, however in the 1860s to 1880s discoveries of gold and diamond deposits were found in the region and dramatically changed the Transvaal’s economy, marking the beginning of the so-called Mineral Revolution. The Mineral Revolution fuelled rapid industrialization and economic change in South Africa and highlighted the need for a permanent workforce to maximize the profits to be had from mining minerals. In 1886 further discoveries of significant amounts of gold deposits occurred in the Witwatersrand (‘ridge of white waters’ in Afrikaans) area. This discovery resulted in a huge influx of foreign miners seeking work and led to the establishment of the city of Johannesburg. The Isle of Man has a long and well established history of mining and in the late 1800s many of its miners and their families were drawn to the Transvaal (especially the Johannesburg area) to seek employment and possible fortune. On arrival, emigrating Manxmen found little or no support in this region of South Africa, already blighted by warfare. Therefore in May 1899, a group of 26 Manxmen gathered at the Dive Hotel in the Transvaal and formed the Transvaal Manx Association. The Association’s objectives were to assist (emotionally and financially) any Manxmen in the Transvaal who through misfortune, sickness or distress had become incapacitated. It had regular social meetings and annual reunions held on or near to the 5 July (Tynwald Day). Many of their social gatherings would consist of dinners, concerts and dances. Throughout its history the Association has done much philanthropic work in and around Johannesburg. The Association also continued their support of the Manx people In the Isle of Man in times of need. Looking at the image below you will see an extract from the Transvaal minutes from January 1910. 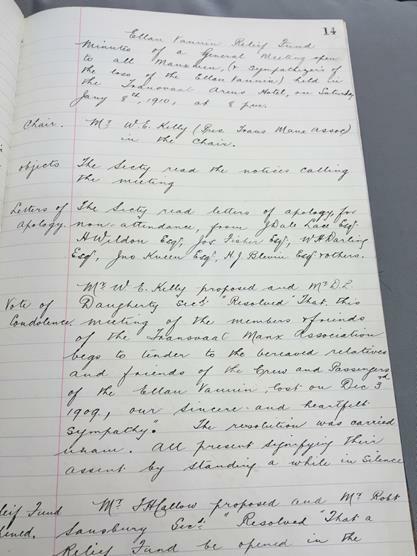 An extract from a minute book of the Transvaal Manx Association January 1910. Reference number: MD 15016/2. Members and friends of the Transvaal Manx Association met to discuss the terrible tragedy of the sinking of the Ellan Vannin. A ship lost on the evening of the 3rd December 1909. The Ellan Vannin was a Steam Packet Ship bound for Liverpool that never made it. The small ship was carrying 15 passengers, 21 crew members, 60 tons of cargo and post from the Island. As the journey progressed the weather deteriorated even further, the waves were over 25 feet and the winds were in excess of 80MPH. The ship sank killing everyone on board. Hearing of the tragedy, the South African group proposed that they set up a relief fund to help the relatives of the perished. As it was said at least 58 children had lost one or both parents. Manx people from all over the world also sent money to the relief fund and in total approximately £12,000 was raised by March 1910 (in today’s money that’s about £1.1 million). For the Association’s Diamond Jubilee anniversary in 1959 100 Manxmen sat down and paid tribute to the “Manx pioneers of the last century whose skill helped build the cities of South Africa” stating for the record “that they had made a wonderful contribution to the opening of the Witwatersrand” (Isle of Man Times, 22 January 1960). Many Manxmen had indeed been prominent in the Transvaal, for example as mining engineers, some were elected first citizens of Johannesburg and others were active players in the South African Stock Exchange. Members of the Association dedicated their lives to their adopted country however the society never forgot their homeland and the Isle of Man was at the centre of the Association’s objectives. In 1996 the Transvaal Manx Association changed its name to the Manx Association of Southern Africa to reflect the Association’s expanded geographical membership. The Association today no longer offers the financial support that the pioneering Manx members received; however it is still a thriving society which promotes its members to embrace their Manx roots in the form of Manx poetry, Manx legends, Manx genealogy, Manx history and the many activities of the Isle of Man. For more information on the Transvaal Manx Association click here and here. For more Manx manuscript archives click here. Both archives are available for consultation in Manx National Heritage Library & Archive Reading Room.